Measure Z is a one-tenth of one percent sales tax collected in Fresno County. 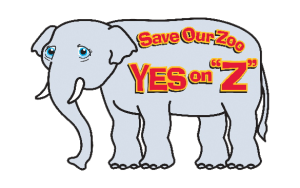 In 2004 and again 2014, Fresno County voters overwhelmingly approved Measure Z – which will repair animal exhibits and aging Zoo facilities, and bring back more large animal exhibits to Fresno Chaffee Zoo. Over the past ten years, Measure Z has generated $110 million for the Zoo. One-third, or about $33 million, of Measure Z revenue is being used to support Zoo operations, and two-thirds, about $66 million, is dedicated to capital improvement projects. Those improvements have included the renovation of animal habitats like the Reptile House, a new River Otter exhibit, Tropical Treasures, the Malayan Tiger exhibit, Bird of Prey and, most notably, the new King Cobra and Komodo Dragon exhibits. General enhancements have included landscaping, the Giraffe pathway, the front entrance and the upcoming children’s water play area. Sea Lion Cove was the first major exhibit built with Measure Z funds. Completed in 2012, the $10.9 million project has been attributed with the robust increase in Zoo attendance. In addition, Sea Lion Cove was awarded with the 2014 Exhibit Award by the Association of Zoos and Aquariums (AZA) – this is the highest honor that can be given! African Adventure will be the most significant project completed with Measure Z funds from the first ten years of the tax initiative. Recently opened, the $56 million exhibit, is a world-class, multi-species exhibit complete with lions, African elephants, meerkat, cheetahs, giraffe, Southern white rhinoceros and zebras. Measure Z also helps keep Fresno Chaffee Zoo affordable for families and all Fresno County residents. The low entrance fees, improved exhibits and improved visitor amenities have drawn so many people to visit the Zoo that attendance has increased 58 percent over the past five years and has set records each year since 2011. The first Measure Z expired in 2014, and was again approved by Fresno County Voters on November 4, 2014. By voting to continue funding Measure Z for the next 10 years, the Zoo can continue to provide excellent animal care, upgrade existing exhibits, establish new exhibits, and provide educational and conservation opportunities for families throughout Fresno County and to all who visit Fresno Chaffee Zoo. While Measure Z funds make capital improvements possible, it is contributions from individuals, organizations and companies that will bring the Zoo experience to life. Simply put, public support enables, earned income sustains, and charitable donations enhance the mission of our 501 (c) 3 nonprofit organization. Philanthropic contributions bridge the gap that exists between earned and tax revenues and the true costs of running and maintaining a world-class Zoo. They provide the margin of excellence that transforms an ordinary Zoo into a magical learning adventure of a lifetime. The tax measure required two-thirds of the voters to approve a Fresno County tax of one-tenth of one percent – or one dime out of every $100 spent on retail transactions – to go to the Fresno Chaffee Zoo capital improvements. The Fresno County Zoo Authority is the public agency responsible for the administration of Measure Z, the unique transactions and use tax (sales tax) which is collected throughout Fresno County for the support of Fresno Chaffee Zoo in the City of Fresno. A different organization, the private non-profit entity, Fresno’s Chaffee Zoo Corporation, that took over the Chaffee Zoo from the City of Fresno on January 1, 2006, is responsible for the Zoo.